I frequently find myself thinking that the dumbest thing we Internet marketers ever did in social networking was to rename it social media. In the early days of Web 2.0, there was no such thing as social media. Everyone was just working to make software more social, whatever that meant. Then for a while, the terms “social networking” and “social media” were used almost interchangeably. 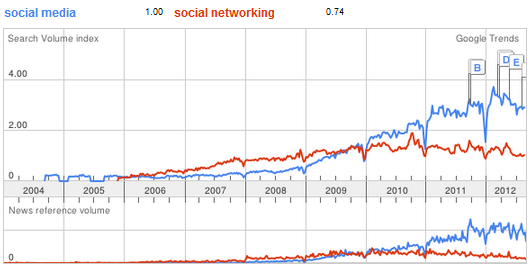 Today, it’s all social media, the Web 2.0 heir apparent of Web 1.0 new media. Social networking is largely reserved for describing the purest of social networks like Facebook and LinkedIn, or the more technical discussions about social graphs and the like. Personally, I strongly prefer the term “B2B social networking”; because once you recognize that the smart way to use B2B social media is to drive B2B social networking, your fundamental understanding of the potential opportunity shifts. Just for fun, I did a quick Google trend analysis on the terms to visualize the issue. has clouded our thinking about social networking with advertising concepts. B2B social networking is not the descendant of new media, like a banner ad, only social. B2B social networking is the new technological enabler of face-to-face meetings, industry events, phone calls, email, sales calls, field marketing and public relations, because it’s the networking, not the media that counts! Would you ever expect a B2B marketer or salesperson to make statements such as these? Cast in this light, these statements are obviously and completely ridiculous. The fundamental purpose of B2B social networking technology is to facilitate B2B networking through automation. In plain English, the purpose of B2B social networking is to increase the frequency, velocity, and quality of business referrals and references. When applied to sales and marketing, this translates into accelerating the B2B purchase process and driving viral revenue growth within an industry. At the core of a referral are two things: a positive, trusted relationship and useful information. Now that sounds just a little bit like sharing a blog post or a comment on LinkedIn. At a minimum, B2B sales and marketing professionals should be using B2B social networking to increase the frequency and velocity of referrals throughout the sales process. At a maximum, B2B social networking can be combined with search, Website marketing and marketing automation to completely automate the B2B purchase process of the new breed of B2B buyer. Business referrals are the mature B2B cousin of B2C word of mouth marketing. Much of what I propose here in regard to B2B social networking also applies to B2C social networking with the one caveat that B2B social networkers are there to do business, whereas consumers use social networks for personal reasons, so B2C brands must tread carefully on their social turf. In the case of B2C, the term “social media” may serve as a useful reminder to B2C marketers that consumers on social networks are not there in the service of their brands. On the contrary, B2B marketers should find B2B social networking more relevant and more straightforward than B2C, provided they view it as networking and not advertising. I also did an experimental search on Google for the term “B2B social networking” and Google decided what I really meant was “B2B social media.” It’s really incredible how Google handles synonyms. Thanks for nothing Google! The is the first post in a series designed to help B2B marketers create better B2B social strategies by thinking in terms of “networking” over “media.” Future posts will tackle the following increasingly complex B2B social networking challenges.